I think that’s the mentality a lot of us old devils have! So, I started collecting a few. Particularly BSAs – bikes made by the Birmingham Small Arms Company Ltd, for those not in the know. 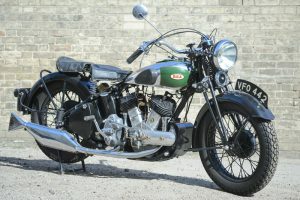 My BSA motorcycles are mostly post-war, but as time has gone on the pre-war ones have become much more interesting. I’ve kept a few that didn’t sell. Most traders do the same. Bikes are mechanical but I think they’ve all got a bit of a soul. 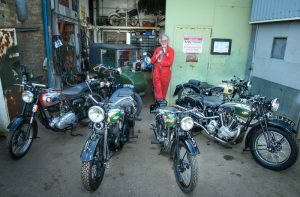 I went to a big auction once – a chap who had a museum in Vienna was selling 400 motorbikes. 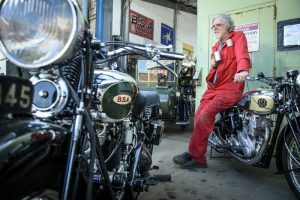 He and his wife didn’t have children, but he said that those 400 bikes he put into the auction were like children to him. It’s similar for me. 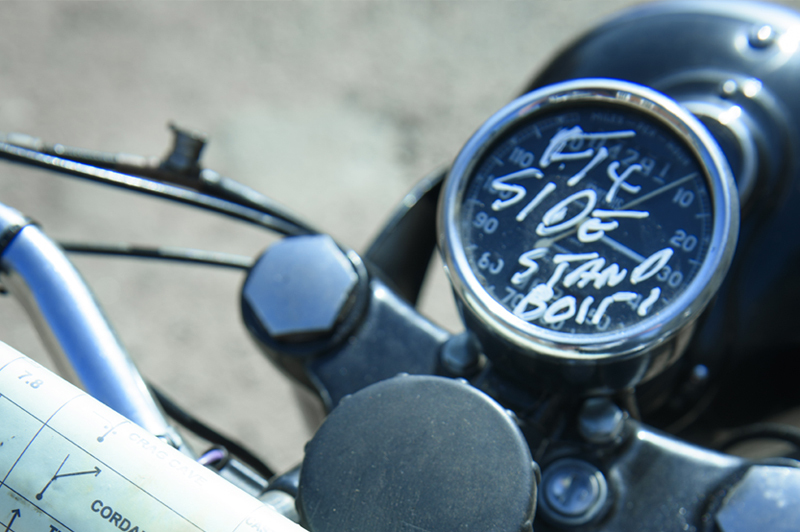 Bikes are just interesting; they’ve all got a story to tell, and some sort of provenance and history to them. 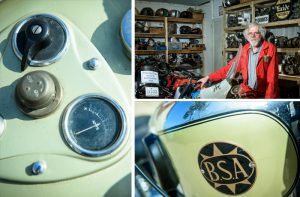 I go to the Irish National Rally every year with an old friend and take a 1950s BSA motorcycle that belonged to Beret, our mechanic who sadly died. It was his special bike, so we use it as a tribute to him. I enjoy going to events, but riding isn’t my greatest passion. The bikes are always here, and when the mechanics and I ride them it’s usually to check them out, so the intrigue of riding isn’t as strong as it could be. But the intrigue of the machine certainly is! Power rating: 750cc. They didn’t tend to quote horsepower on pre-war BSAs, but it’s something like 30bhp. How did you come to acquire the bike? I bought it from a colleague in 1977. He found this grubby old thing in a shed, in the village I was born and brought up in. I went to see it, fell in love with it, and it had to be mine! I had a friend restore it 18 months ago. It’s as close to the original spec as we can get commercially. Pure enthusiasts would try to get every nut and bolt right, but we can’t do that here. 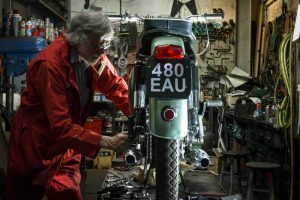 We had parts made all over the place – the mudguards were made in Birmingham, the bike was painted in Bescanó near Girona, the chrome was done in Barcelona, and the bike was assembled in Figueres on the Spanish/French border. 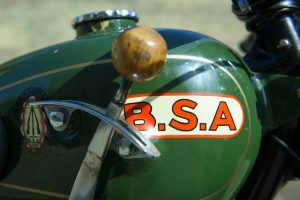 The most important thing to know about this bike: It’s probably the most desirable type of BSA around at the moment because it’s an OHV V-twin and they didn’t make many of them. Power rating: 1000cc. About 24bhp. How did you come to acquire the bike? 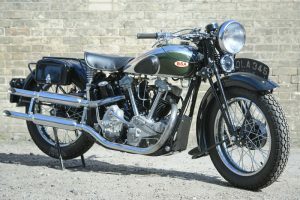 It was restored by the Chief Police Mechanic in Essex. He sold it to me, I sold it to someone else. It went around the houses and I’ve bought it back two or three times. It just keeps coming and going – and now it’s taken root here again! The most important thing to know about this bike: It’s the largest BSA bike that was made in the ‘30s. It’s a big, chunky, solid muscle bike. Power rating: 150cc. About 5bhp or 6bhp. How did you come to acquire the bike? It was scruffy when it came to me – I think I bought it at a Shepton Mallet auction, about 25 years ago. I sold it to a friend who restored it and sold it back to me. Then I sold it to a chap in Ireland. He was terminally ill and just wanted a small bike to enjoy during his last days. It eventually came back to us, for the third time, and I’ve had it in my collection for a while now. What makes it a highlight for you? What can I say about the dear little thing? 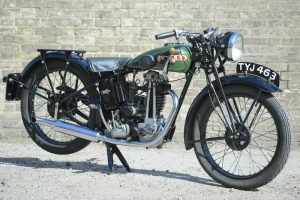 It’s just a lovely, interesting lightweight bike – the smallest BSA made in the ‘30s! 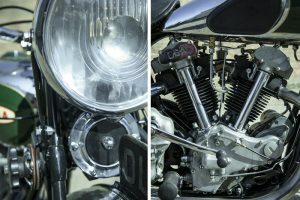 The handlebars are split – two joined together in sockets rather than one continuous bar. Power rating: 560 overhead valve. Horsepower would be about low 20s. How did you come to acquire the bike? I bought it in Denmark, from a guy who had an extensive collection of BSAs. This was the star of his collection – I had to buy quite a few bikes just to get this one. It’s got its original Danish documents too, which is rather nice! What makes it a highlight for you? It was restored a long time ago and it’s just a lovely, mellow machine. 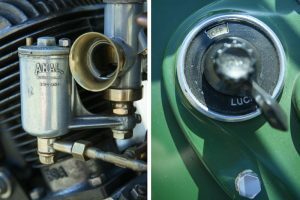 These were the Rolls Royce of BSA production in the ‘30s. 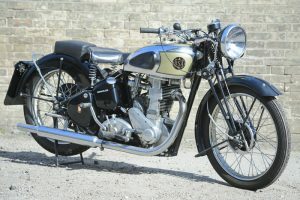 It’s a race bike, but sold as a road bike – they didn’t make racing bikes pre-war. How did you come to acquire the bike? I purchased through eBay about nine years ago in a seriously accident-damaged condition. What makes it a highlight for you? 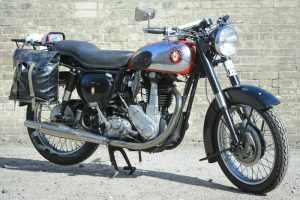 Before its accident, the bike had been totally rebuilt by a serious BSA enthusiast, with many special features such as a unique hinged seat mechanism. I rebuilt the bike keeping it as true to its pre-accident specification as possible. It’s one of my favourites to ride, being very comfortable and extremely dependable. I have used it for a couple of Irish National Rallies and the Federation Internationale Vehicule Anciens (FIVA) rally in Andorra in 2015. Power rating: 770cc, but upgraded to 1000cc, V-twin. How did you come to acquire the bike? I bought it restored from Bonhams auction house. It had belonged to a well-known character who passed away. What makes it a highlight for you? This one is the pride of my collection! It’s a big, heavy motorbike that was made in the ‘20s, with a purpose-built taxi sidecar. Two people can sit side-by-side, so it’s quite broad and not very fast. 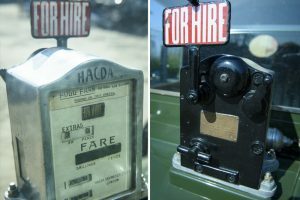 It’s still got its taxi meter and the little sign that flips up to say ‘for hire’. 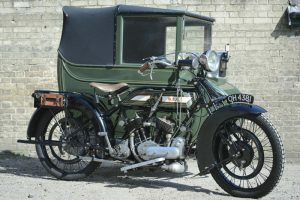 There was once a fleet of them in Brighton, and the one I have was featured in the advertising blurb in the 1920s – ‘Get off the train, hail a taxi sidecar, and off you can drive to Timbuktu’ or something like that! The passengers would sit in the relative warm, while the poor driver was freezing his whatsits off! Learn more about Andy and his collection of classics by clicking here.